The sugar-loaded nectar that our Spicebush Swallowtail is drinking-in from this monarda flowerhead is as sweet as? Who knows? If you know please share. The magnificent jewelry on exhibition here is not being viewed at Tiffany, Cartier’s, Sotheby’s or Christies but can be experienced at your local, county, state or national park/wildlife refuge in May, June, July & August in 2012. 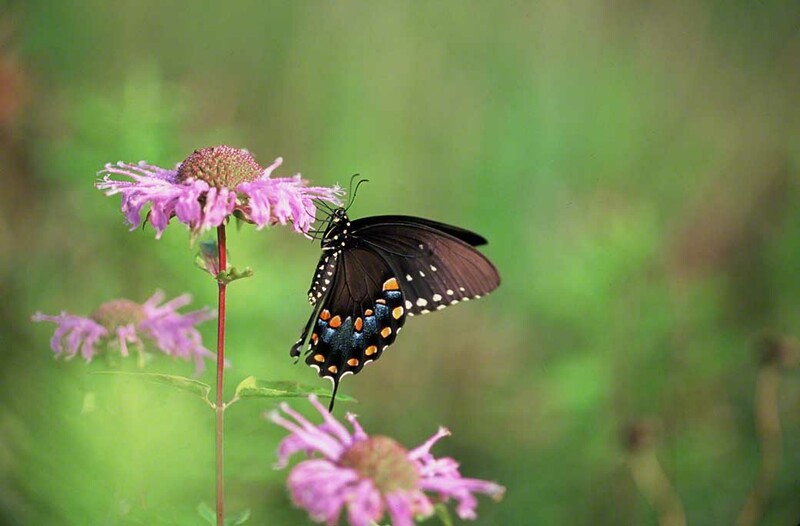 All butterflies differ from one another, so not all Spicebush Swallowtails sport such fine color. But stick around such a wildflower bed, and whisssst, in will fly a bedazzler! Gardeners! Monarda has been hybridized producing dozens of varieties. They are easy perennials. Provide good sun and well-drained soil and if they take to a spot, they may bless it for years and years and years. The yield = butterflies of many species, honeybees and hummingbirds.